Russian President Vladimir Putin on Sunday said a civil war might erupt in Egypt due to the overthrow of President Mohammed Mursi. “Syria is already in the grips of the civil war ... and Egypt is moving in the same direction,” Putin told Russian state news agency RIA Novosti during a visit to Kazakhstan’s capital Astana. 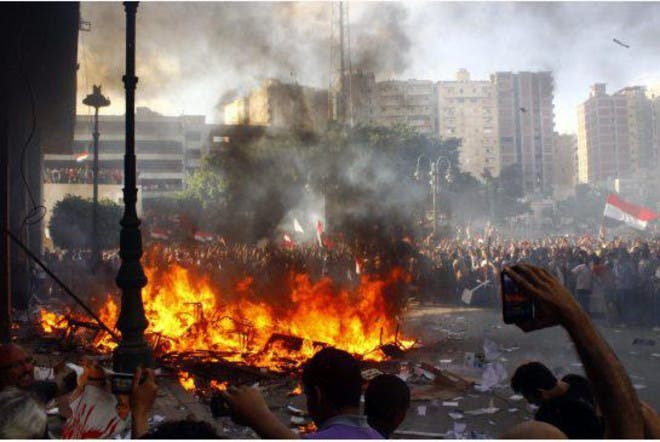 Since the president’s removal, over a 1,000 people were wounded during the dispute between Mursi’s supporters and his opponents, according to The Associated Press. Meanwhile, Iran’s reaction to the overthrow of Mursi was described as “improper” by the military. Foreign ministry spokesman Abbas Araghchi believes that Mursi’s supporters should continue their quest of reinstating him, adding that the presidency shouldn’t be elected by “the streets”, according to the official IRNA news agency on Sunday. “Islamists and revolutionaries should not be frustrated,” said Araghchi, adding that the “Arab Spring can be followed by warm summer and cold winter,” too. Araghchi did not call the move a "coup." Mursi is responsible for the termination of three decades of diplomatic separation with Tehran that dated back to the 1979 Islamic revolution in Iran.